Latest encryption technology to protect your personal details.  You get absolutely UNLIMITED bidding until your expiration date. 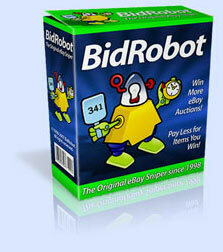  Snipe bid as many auctions as you want until your expiration date.  Absolutely No limit on the amount you can win until your expiration date!  ** BIDROBOT'S WIN GUARANTEE: If you don't WIN MORE THAN the amount we've promised, then your account stays open for FREE, at our expense, past your expiration date, until you win the amount we promised! to place bids at eBay on your behalf (This page is secure).